Margaret (Maggie) Jacobson's life is looking up. She's 27, just earned her MBA and has been offered an incredible job at a very high salary. Her boyfriend Chip, soon to be fiancee, is planning to propose on Valentine's Day in a very unique manner, but then an unexpected and tragic accident leaves Maggie with a spinal cord injury putting an end to those hopes and dreams, or does it? This is one of those books that even though things look bleak, you have a feeling everything will be okay for Maggie in the end. This is a story about the ups and downs of life and relationships. It makes you realize that sometimes a tragedy can make you stronger. 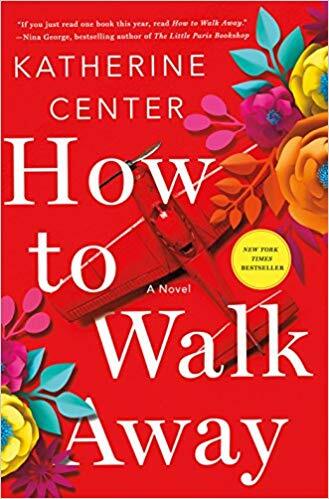 After reading a few too many sad or depressing stories in March, How to Walk Away turned out to be a pleasant surprise. Maggie's story has some highs and lows, just like most of our lives, but, in the end things have a way of looking up. I'd definitely classify it as a lighter read, not perfect but enjoyable. The audio version read by Therese Plummer was very well done. It's good that despite the accident, it turned out to be an enjoyable, light read. This sounds like a lovely book, Diane. Terrific review! I'm glad it wasn't too tragic. Hooray for a good surprise! I liked this one, too. I agree that although it was sad and she was going through a ton, it wasn't a downer book. It sounds sad so I am glad it wasn't too bleak. I always enjoy Center's books. Hmmm, I haven't heard about this book until now, but it sounds like something I might enjoy. I'll be on the lookout for it at our library. I listened to this last year and it was in my top 3 favorites of the year. I want to read another of her books. I need a pleasant surprise to read myself.